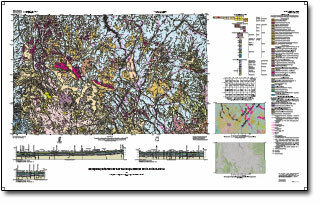 The geologic map of the Valle 30’ x 60’ quadrangle is the result of a cooperative effort between the U.S. Geological Survey and the National Park Service to provide geologic information for regional resource management and visitor information services for Grand Canyon National Park, Arizona. The map area encompasses approximately 1,960 mi2 within Coconino County, northern Arizona and is bounded by long 112° to 113° W. and lat 35°30’ to 36° N. and lies within the southern Colorado Plateaus geologic province (herein Colorado Plateau). The map area is locally subdivided into four physiographic parts; (1) the Grand Canyon (Cataract Canyon and extreme northeast corner of the map area), (2) the Coconino Plateau, (3) the Mount Floyd Volcanic Field, and (4) the San Francisco Volcanic Field as defined by Billingsley and others, 1997. Elevations range from 7,460 ft (2,274 m) on the Coconino Plateau along State Highway 64 northeast corner of the map area, to about 4,200 ft (1,280 m) at the bottom of Cataract Canyon. Settlements within the map area include Tusayan and Valle, Arizona. State Highway 64 and U.S. Highway 180 provide access to the Tusayan and Valle areas. Indian Route 18 is a paved highway in the northwest corner of the map area that is maintained by the Hualapai and Havasupai Indian Tribes and leads from State Route 66 about 7 mi (11 km) east of Peach Springs, Arizona to Hualapai Hilltop, a parking lot just north of the map area at the rim of Cataract Canyon where visitors begin an 8 mi (13 km) hike into Havasupai, Arizona. Other remote parts of the map are accessed by two dirt roads, which are maintained by Coconino County, and by several unmaintained local ranch roads. Weather conditions restrict travel within the area and visitors must obtain permission to access a few local ranch lands in the south-central edge of the map area. Extra water and food are highly recommended when traveling in this remote region. Access into Cataract Canyon is restricted to horse or foot travel and visitors must obtain permission from the Havasupai Tribe to hike within the Havasupai Indian Reservation. In the central part of the map area, most of the land is privately owned and managed by the Babbitt Ranches Inc. in conjunction with the Nature Conservancy and the Navajo Tribe. In the southern half of the map, land alternates between privately owned land and State land forming a checkerboard pattern. The National Park Service manages land in Grand Canyon National Park (extreme northeast edge of map area), the U.S. Forest Service manages lands in the Kaibab National Forest, the Hualapai Tribe manages lands in the northwest quarter of the map area, and the Havasupai Tribe manages lands within Cataract Canyon and adjacent parts of the Coconino Plateau. This is a zipped package of shapefiles and a style file to facilitate use of the data in ArcMap and other applications. This is a zipped package of files necessary to create an ArcMap Personal Geodatabase project. Views extracted from the database of the 1:24,000-scale geologic mapping. Part or all of this report is presented in Portable Document Format (PDF). For best results viewing and printing PDF documents, it is recommended that you download the documents to your computer and open them with Adobe Reader. PDF documents opened from your browser may not display or print as intended. Download the latest version of Adobe Reader, free of charge.